The AKP government of Prime Minister Erdoğan has effectively decreased the once unlimited power of the army. The power of the judiciary was strengthened. But now that power has too strong a grip on society. Criticism of the firm grip of the judicial power over several opposition groups in Turkey is increasing. It happened gradually. At first, it seemed the increasing influence of judges and prosecutors initiated by the AKP government of PM Erdoğan, which came to office in 2002, would be beneficial to democracy. The judicial power for example started to deal with the ‘deep state’, an anti-democratic network of prominent figures in for example the bureaucracy, army, secret service and the mafia. The unlimited authority and privileges of the army were curtailed, military courts for civilians were abolished and for certain crimes army personnel now have to appear before a civilian judge. Maya Arakon, sociologist and political scientist and until recently an assistant professor at Yeditepe University in Istanbul, used to have faith in the way the army was dealt with by the AKP: ‘The army has always controlled the country since the foundation of the republic in 1923’, she says. ‘So when the trials against the ‘deep state’ started, I and many others were happy with that. It is not wrong for the government to have more power than the army. But then that power has to be used in the right way for the right goal. It should benefit the people, who should get more rights and freedoms. That is not happening now, even though the government insists democratisation is the goal of their policies. The power of judges and prosecutors is turning itself against democracy now, claims Arakon: ‘The AKP uses judges and prosecutors to silence opponents. The KCK trials are an example of that. The Kurdish party BDP is the biggest rival of the AKP in the Kurdish southeast of Turkey.’ Conspiracy thinking? The first arrests in the KCK case were at the beginning of April 2009. The local elections, which the Kurdish party won convincingly, were held at the end of March 2009. But not only Kurdish politicians and activists are victims of the ever tighter grip that the judiciary has on society. Even the once so powerful army doesn’t escape. 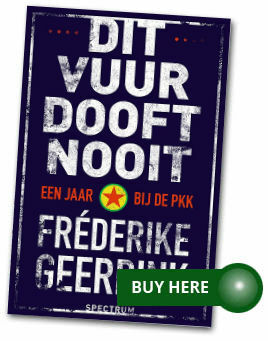 An odd alliance: in the nineties the army was so powerful that they could ruthlessly and without fear of punishment get rid of the PKK or anybody they even suspected of having sympathy for the separatist movement, but now they are in a way in the same boat as the Kurdish activists. They are no longer hand and glove with the government, like before, but have become opponents. And they taste defeat. Part of the trials against those involved in the ‘deep state’ is the so called Balyoz case. That case is about a group of high-ranking, partly retired army men who have allegedly conspired against the AKP government. They had spectacular plans: they would first cause great unrest in society, for example by bombing a huge mosque in Istanbul during Friday prayer and provoke a military confrontation with Greece, and then topple the government. He starts a presentation and shows how evidence has been doctored. It’s about copied signatures, about lost CD’s, about dates that don’t make sense. It’s too complicated to explain it all here, but even some people who are not automatically on the army’s side are becoming convinced that the evidence in the Balyoz case isn’t clean. And every activist Kurd automatically has, according to many Turks, a PKK odour, whether he or she takes up arms or supports the Kurdish struggle as a member of Parliament or mayor. There is sympathy among human rights activists and liberal intellectuals, but in Turkey that’s only a very small group. Doctored evidence, unlawful evidence, indictments for practising democratic rights, it would be less bad if at least the suspects could rely on the independence of the judges in their cases. But they don’t rely on that. They have little reason to. Already during the trials it turns out that (internationally) respected legal norms are not being followed and that judges don’t seem to care. Norms such as the access of lawyers to evidence. Both Celal Ülgen and Reyhan Yalcindag don’t get access to evidence, exactly the evidence that they think has been fabricated or consider unlawful. Another example: the very long pre-trial detentions. Some of the suspects had been in remand for years, sometimes without indictment or without having any information on when the trial would start, continue or finish. That’s not the case for suspects in other high profile trials in which the suspects are close to the government, as became painfully clear in October. In a huge fraud case against board members of Deniz Feneri Dernegi, a charity organisation close to the government, the judges decided to release all suspects from remand. Does Maya Arakon think the tide will turn within a reasonable time? ‘This is Turkey, she sighs. ‘Everything can change in a day and nothing can change in years. I don’t know, but I don’t have much hope.’ The AKP is firmly in charge: the party won the elections last June with a bigger majority than ever before. Most Turks are not directly harmed by the developments in the judiciary and don’t feel very involved in huge, elusive court cases against Kurds and military personnel. They vote based on changes in their own lives, or, in other words, based on a growing wealth and a growing economy. Balyozlawyer Celal Ülgen clings to Europe. That’s also why he talks to the European press. ‘The consciousness about this matter has to grow in Europe’, he says. ‘Then maybe Europe can pressure Turkey more.’ A huge paradox, because it’s exactly EU pressure that helped erode the power of the army in the last couple of years. An even bigger paradox is that the hope of the Balyoz suspects, military men who still fight bitterly against the PKK, is focused on the solution of the Kurdish question. Ülgen: ‘They are terrorists, and my clients are also jailed based on terrorism laws. If there is ever to be an amnesty law for PKK members, there is a good chance that same law will free my clients too.’ He considers that chance bigger than the chance a judge will judge fair. You have composed an excellent article as usual. However, a bit clarification is needed. When you refer to the “strengthening power” of judiciary, one comes to think that the judiciary in Turkey is getting more independent and impartial, hence fair. Well it’s not the case. The judiciary is not getting more independent and impartial. It’s just the executive branch (i.e. the government) firms its grip on the judiciary. Otherwise, the judiciary in Turkey has always been firm and ruthless on dissent in Turkey. Nothing changes in that sense. One of the best summaries of the situation I have seen. They’ve arrested our lawyers now–so it is only getting worse.